Namii: White resigns. I will show the reason later. So why should white resign? Namii: Ah, I forgot to imply Japanese rules were used. Ok, I'll show the solution now. Namii: You are correct. In the real game, white had 3 less captures and black won by 2.5 points. Both players also left the cut alone. Herman: What if at ? Namii: Very interesting... I had not seen this move. I will put another diagram at the bottom. Namii: You are all so boring... (You are not the only one who said "white should push his luck" etc) I think the resignation is beautiful and would at least leave the spectators very puzzled. gnostic? 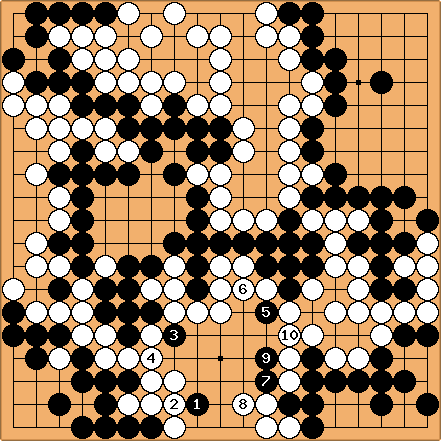 : If black just filled the last dame, and white is already ahead, white can just defend. Defending doesn't cost anything in Chinese rules aside from the opportunity cost of not being able to play something that actually gains points (i.e. filling a dame). Of course, if in the actual game white was behind by 2.5 points, and there were no dame and no tesuji available for white, just defending and counting up the game wouldn't be so bad. He could always find out that his count had been off somehow. Stranger things have happened. Namii: Your move was very sharp.. I didn't find a way to counter it for black. However, I found a new move. After the sequence up to white has no move. We should probably update the page, since the original solution was not really a solution... :( and it was such a beautiful live-inside, too. Namii: White faces damezumari. 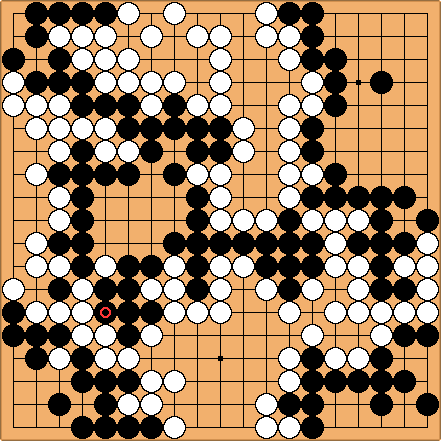 If white plays at a next, black will capture the big chunk of stones with b.
Namii: Now that I look at it again, black can also just play all the ataris (b, W connects, , w connects) and then connect at a. My head is suddenly starting to feel dizzy. Your move was very brilliant, though. It must have been some sort of a blind spot to me, because I didn't find it when I rechecked everything before posting it here. I guess we can leave the page as it is as the discussion is quite interesting. Bill: If at 3, at 2.